Skim fat from drippings. You can also refrigerate the drippings, allow the fat to harden on top, and remove that way. In a medium saucepan, combine drippings, ½ cup milk, and bouillon cube, and bring to a low boil, stirring constantly. Dissolve cornstarch into remaining ½ cup of milk and whisk well to prevent any lumps from forming. Pour milk and cornstarch into the drippings and keep stirring. Drippings will thicken to a gravy consistency. 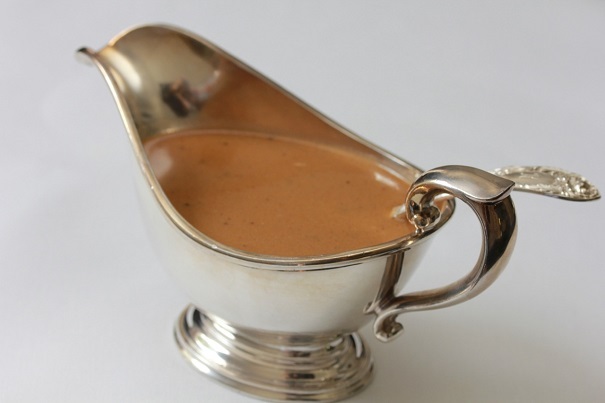 You can add milk to thin gravy, or allow it to cook down if you prefer thicker gravy. When it reaches the preferred consistency remove from heat. Reheat just before serving.